If agar plates or absorbent pads to be wetted with liquid culture medium are used instead of Nutrient Pad Sets, Sartorius cellulose nitrate (cellulose ester) membrane filter are recommended. Naturally, the membrane filters must be free of microbes. For this purpose, they can be boiled or autoclaved. 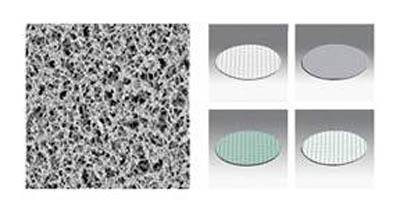 These membranes are offered in a choice of three different colors to suit the specific test application, and provide a high-contrast background to colonies or particles.These membrane filters are in accordance with the following norms: ISO 7704, ISO 7899-2, ISO 8199, ISO 9308-1 and EN 12780. In addition to this they have been manufactured for use especially at the same time with Sartorius Nutrient Pad Sets in accordance with many international regulations and recommendations: international pharmacopoeias, DIN and ISO Standards, the American Standards for Water and Foods, mineral water regulations, brewery guidelines, such as MEBAC or EBC, and recommendations of the food industry, such as LMBG, NCA and ICUMSA. All membranes are made of cellulose nitrate (cellulose ester), a material which assures effective retention with high flow rates and optimum colony growth. The printed grid divides the filtration area into 130 squares, each measuring 3.1 x 3.1 mm makes the counting easier, especially for higher bacteria counts and for micro-colonies, but does not influence the growth.